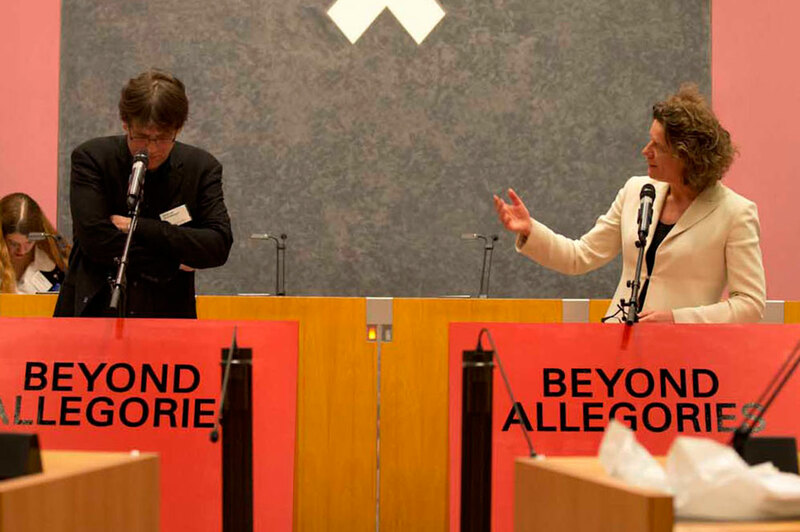 The following text was developed on the occasion of the Beyond Allegories debate, for which 250 artists, politicians, union representatives, university professors, dramatists, representatives from refugee organisations and NGOs, journalists, and students gathered together for seven hours in Amsterdam’s City Council to discuss the role of art within governance, political mobilisation and action. This debate was organised by Ann Demeester (De Hallen | Frans Hals Museum), Carolien Gehrels (until recently Alderman for Art & Culture, PvdA / Labor Party Amsterdam) and the artists Hans van Houwelingen and Jonas Staal in an effort to forge new progressive alliances. The text will be part of the DVD-book Beyond Allegories, a collection of the resolutions and videos that resulted from the project, which will be published this year. In the daily practice of art, in particular concerning art in the public space, politics explicitly operates under the pretext of an uninterested relation as advocated by nineteenth-century politician Johan Rudolph Thorbecke. Many of the state-founded art committees are formally independent of the government. As such, however, they function as convenient covers for government and private agendas. Right now, when many of these committees face budget cuts and we see a growing trend to decentralise policymaking at the city level, the time has come for local policymakers – who were already in charge – to shed this veil of disinterest and openly commit to art projects on the level of their content and value. In 2009, Carolien Gehrels said, “When culture is a sector in which government cannot govern, politics will abandon the arts.” Following this statement, a debate with all cards on the table leads to greater political commitment, mutual understanding, more nuanced results and thus a better city. Three Dutch municipalities will, under the guidance of the Raad voor Cultuur [Council for Culture], examine how local administrators can/should be involved in art projects and how they can give shape to the interaction between artists and politicians. They will debate the results of this research in 2014 in their respective municipal councils in preparation for the upcoming presentation of the quarterly national policy notes on culture, Cultuurnota, and the local policy plans, Kunstenplannen 2017–2020. In the early part of the fourteenth century in Sienna, Ambrogio Lorenzetti – whose series of frescoes inspired the 2011 project at W139 in Amsterdam Allegories of Good and Bad Government – stated that in a well-governed city the arts will flourish and the citizens will be happy. Today our governments happily preach the dictum of the creative industry and creative city as the means to a prosperous city. As the result of a lack of true involvement the arts are all too often (unconsciously!?) regarded in economic terms. A rigid focus on business models, however, leads to an impoverishment of artistic content and to a make-believe cultural life. Unilateral quantitative “quality” checks and the increasingly used prefix “top” (top-art, top-institutes, top-talent, top-artist, etc.) leads to artistic segregation without an artistic reason that necessitates this. The creative city seems a blessing for administration and policymakers but must not turn into a curse for the arts. Excesses of the “creative city” are paradoxically the result of a lack of political involvement with the arts. Our proposal is to intensify the debate between artists and politicians on a local level in order to establish a balance between economic and intrinsic artistic value and goals. In order to establish this, three municipalities will map their artistic ecosystems and will discuss their cultural policy regarding education, housing and grant systems. The power and success of art becomes apparent when one would imagine that in the history of cities like Paris, Rome or Amsterdam drastic investment in the arts would not have taken place. Urban space arises from a tangle of public interests geared toward usability, accessibility, durability, safety, affordability, etc. Every one of these utilities has its own specialism and advocates. Artistry as a specialty, however, is the outsider. Only when all other cards have been shuffled and divided “meaning” is addressed, usually in the form of an added artwork. This one-dimensional use of art is too limited. Governments should take the initiative to structurally use the expertise of artists within urban planning projects. Governments state the involvement of artists and their expertise as a requirement of urban projects. As pilots in which artists are involved from the initial phases of the planning process we propose the projects involving the following areas in Amsterdam: Houthavens, Amstel III and the development of Amsterdam Noord Overhoeks in combination with the renewal of the Van der Pek neighbourhood. All other video registrations of Beyond Allegories including the Introduction and Epilogue can be found on this page: www.vimeo.com. Mariko Peters, Metahaven & Jonas Staal, Towards an Extra-Parliamentary Democracy! Carolien Gehrels has been an alderman for the Labor Party (PvdA) in Amsterdam from 2006 to May 2014. In her eight years as an alderman, she was responsible for, among others, economic affairs and art and culture. In 2009 she gave the well-known Boekman lecture Kunstbeleid in een postideologische? samenleving [Art policy in a post-ideological? society], in which she pleaded for a larger involvement of politics with the arts. At the time she stated this about art: "We may also govern in this area. We may also have an opinion. And we may even judge.” See further: www.pvdaamsterdam.nl. Hans van Houwelingen studied at the Minerva Art Academy in Groningen and at the Rijksakademie van Beeldende Kunsten in Amsterdam. His work manifests itself internationally in the form of interventions in public space, exhibitions, lectures and publications, in which he investigates the relations between art, politics and ideology. He publishes regularly in newspapers and magazines. The monograph STIFF – Hans van Houwelingen vs. Public Art (2004) offers an overview of his projects and texts and an extensive reflection on his work. The publication Update (2008) describes the permanent update of the Lorentzmonument in Arnhem during the exhibition Sonsbeek 2008 and Undone (2011) presents nine critical reflections on three recent works. See further: www.hansvanhouwelingen.nl.